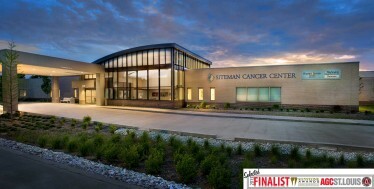 The Associated General Contractors (AGC) of St. Louis announced the Siteman Cancer Center as a finalist for the 2013 Construction Keystone Awards. The award program honors the achievements of St. Louis construction firms in building facilities that enhance the quality of life in the community. PARIC’s submission of the Siteman Cancer Center project, was named as a finalist in the category for General Contractor/Construction Manager for aConstruction Project of $40 million or more. This is the 8th year in a row where PARIC has submitted a project that has been selected as a finalist. PARIC has had an impressive track record of winning Keystone Awards during this period, as they took home 2 Keystone Awards last year alone with the Peabody Opera house, and the Three Sixty Rooftop Bar projects. This $10.5 million project was a partnership between Barnes-Jewish Hospital and Washington University School of Medicine. It was a true design-assist project with a unique 38,000 square foot state-of-the-art facility designed around improving the patient's experience during treatment. The beauty of this facility, which sits on a sixteen-acre site in South St. Louis County, Missouri, is that it houses multi-disciplinary doctors allowing patients to see as many as three physicians in one visit. Each patient can have their entire treatment plan mapped out in one trip, thus eliminating any additional stress or complications from additional travel. The facility also includes a retail pharmacy, exam and infusion areas, laboratories, waiting areas, offices, offers advanced treatments and more than 240 clinical trials. There is also plenty of green space and plans for a healing garden. The facility can treat up to 200 patients and visitors per day. PARIC, and Washington University in Joint Venture with BJC Healthcare will find out if they won the notable Keystone Award during the Awards Gala on November 14, 2013. The Siteman Cancer Center, the only National Cancer Institute-designated Comprehensive Cancer Center in Missouri, is ranked among the top cancer facilities in the nation by U.S. News & World Report. Comprising the cancer research, prevention and treatment programs of Barnes-Jewish Hospital and Washington University School of Medicine, Siteman is also Missouri’s only member of the National Comprehensive Cancer Network.